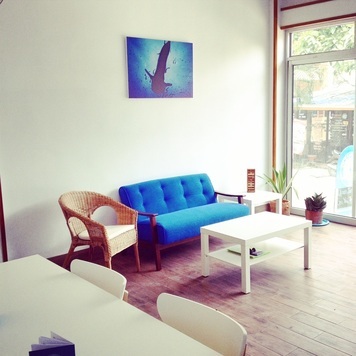 The Ocean Sound main office is located in Chalok, the southern part of Koh Tao. We are easy to find, right on the main road, next door to Cappuccino cafe, and across the street from 7-11. Our office has high-speed wifi that you are always welcome to use, 24 hours per day, and a free water bottle refill station to reduce plastic waste, and save you a bit of money! Our office is open from 9am-5pm daily. Stop by and say hi, or, outside of business hours, send us an email. 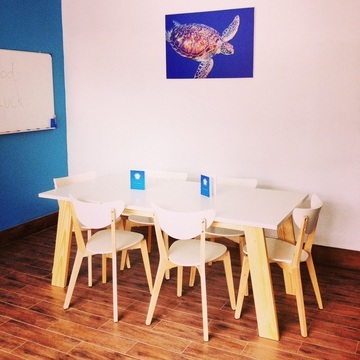 Next door to the office is our air-conditioned classroom, where students begin to learn to dive. This is also where our equipment room is located, and kept well stocked with new, high-quality, immaculately maintained dive gear.